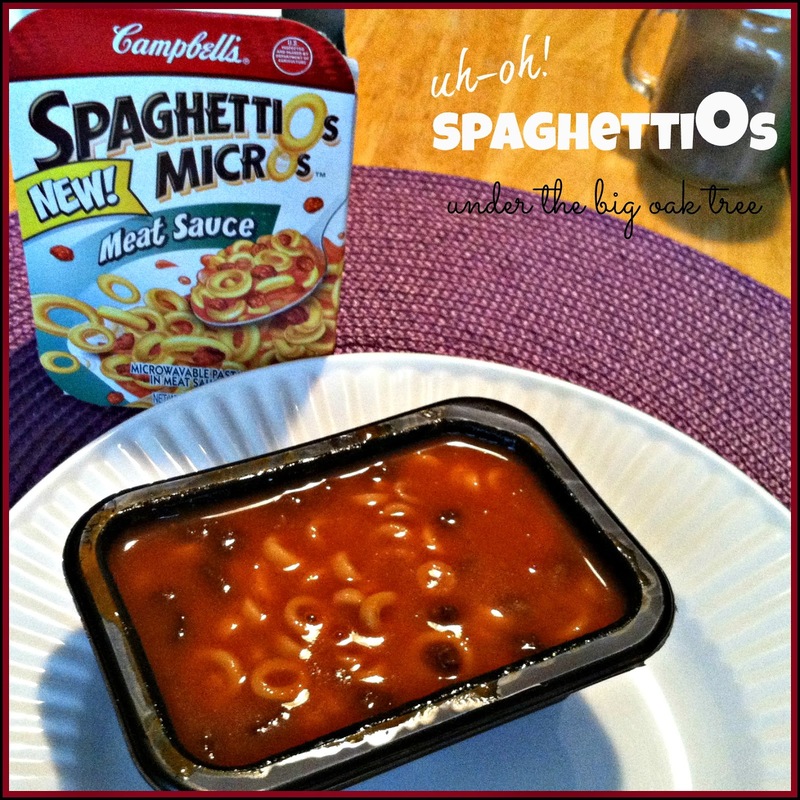 Under the Big Oak Tree: NEW SpaghettiOs MicrOs ~ A Perfect After School Snack! NEW SpaghettiOs MicrOs ~ A Perfect After School Snack! Are you looking for new ideas for after school snacks for your kiddos? So often I've heard parents complain that their kids want a snack as soon as they walk in the door from school. Then, by the time dinner rolls around, the kids are no longer hungry. With the NEW SpaghettiOs MicrOs, I wouldn't guilty if my kiddo's dinner was "spoiled" if I gave served them to my daughter as a snack. SpaghettiOs MicrOs are microwaveable and convenient. A perfect snack alternative for busy school days. The single serve, no-metal container has an easy-to-peel lid so they are more kid friendly than other microwaveable bowls, and if your child is allowed to use the microwave themselves, they can get their own snack while mom or dad are unpacking the backpacks and checking for that day's homework assignments! With four tasty flavors, you'll be sure to find one your kiddos will love! Kids will love MicrOs because they are fun to eat and parents will love serving them because each serving of MicrOs contains essential vitamins and minerals. They are low in fat, too, making them the perfect snack to refuel kids between meals. All that and they are an easy and delicious snack without the mess! And in case you are wondering, the suggested retail price of the New SpaghettiOs MicrOs is just $1.29! Campbell's NEW SpaghettiOs MicrOs are expected to hit shelves Nationwide in August 2014! Disclosure: I received free samples of SpaghettiOs MicrOs along with a t-shirt and fact sheet about the product, so that I can spread the word about this new item. These would make a great after-school snack for my kids.